Enter a platform gaming paradise where it is actually fun to fail. Ubisoft’s Rayman Origins PlayStation Vita version takes platform gaming to a high level as every game element nicely converge into a comical, fun, and challenging experience. 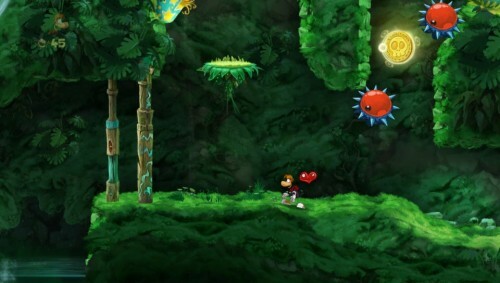 Rayman Origins offers a pitch perfect presentation on the PlayStation Vita while rewarding quick reflexes, which are easily achieve thanks to a smooth control system. In this game, Rayman and his heroic, comical pals must battle the antagonistic Darktoons throughout six uniquely hand drawn worlds sharpened with an outstanding HD quality presentation. The game features more than 100 characters throughout the core one player game mode. 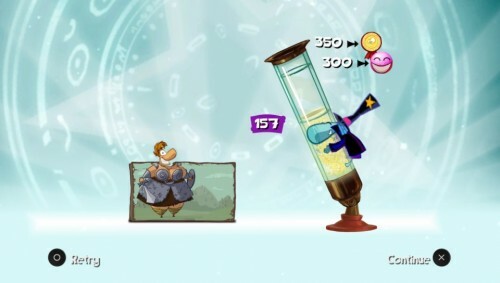 Rayman’s character design shows his feet, arms, head loose from his body, but each component accentuates and enlarges according to player controls. For example, Rayman’s feet enlarge when he kicks. Movement mistakes are costly, but they are so much fun to experience in this game. Barely missed jumps on a ledge are fun not frustrating. Players can change direction mid-air when jumping plus get to enjoy flying, gliding, punching, kicking, hovering, wall jumping, sliding, swimming, diving and other fun actions. Players can progress in multiple ways and face many choices, so the gameplay has a nice open world feel. The game contains 60 levels with gameplay stressing and sometime requiring a frantic pace to successfully progress. Short time lengths while collecting the most items is the most common success method while several unlockables and hidden items along the way boost the replay value to a very high level. The extra collectible relics offer a great hidden object challenge while revealing some expanded story elements. Younger players, including my daughter, cannot usually complete handheld platform games as quickly as the “big screen” console version, but thanks to the distinct design, Rayman Origins was a pleasant exception. Helpful red explanation point icons direct players towards updates they can access while they try to fill each level container with collected creatures and freed friends from cages to progress through the game. 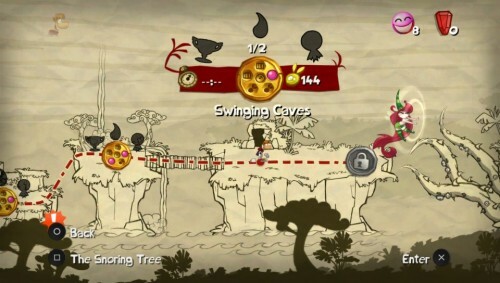 A hilarious summary sequence occurs at the end of each level and marks collection levels that unlock more levels. 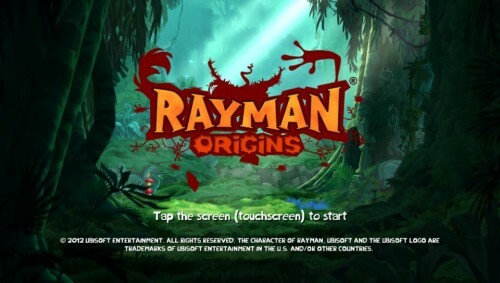 Rayman Origins players with other versions of the game can still relive their experiences here, though this version does not include a multiplayer mode or online gameplay. Exclusives in this version include an unlockable ghost mode where players can beat their best time. Unlock level in the core one player mode to get the same playable level in the ghost mode. Players can also share their best times and other unlockable gifts with online friends. The appealing music soundtrack changes with new events, object interactions or special bonuses. The helpful sound cues make this seriously challenging multitask experience easier for players while special musical instrument sounds, especially drums and strings, fit perfectly into gameplay, physics, and level design. The generous checkpoint system, multi-touch zoom capabilities, touch screen capabilities, and challenging, but not impossible boss battles also boost this quality gaming experience. The well-balanced gameplay, high replay value and stylish design make this game an essential addition to your PlayStation Vita game library. Also available on PlayStation 3, Nintendo Wii, Xbox 360, PC, and Nintendo 3DS. Special note: All included screen shots shown above originate from my gameplay sessions and were taken by pressing the PlayStation button (left) then the start button (right). If you try this method just make sure you are not at a critical gameplay point because you cannot use the controls while the screenshot saves. This entry was posted in Video Game Reviews and tagged Michael Siebenaler, Mike Siebenaler, PS Vita, Rayman, Rayman Origins, Tall Writer, UbiSoft, video games, Vita. Bookmark the permalink.